This year, Instagram has been steadily migrating to their new Graph API, while phasing out their old Platform API. The most recent step was on October 31, when Instagram announced a new Hashtag Search feature as part of the Graph API. The new Hashtag Search replaces the old Hashtag Search, which Instagram is deprecating on December 11. We added support for Mentions and Comment Moderation. In July, Wyng added a new Instagram Content Stream (ICS) feature which enables you to automatically collect all Instagram content when your brand is @mentioned in either the original post or in a comment from the person who made the post. In addition, for content you’ve collected using ICS, you can request rights to the content by commenting on the original post. We’re adding support for Instagram’s new Hashtag Search. 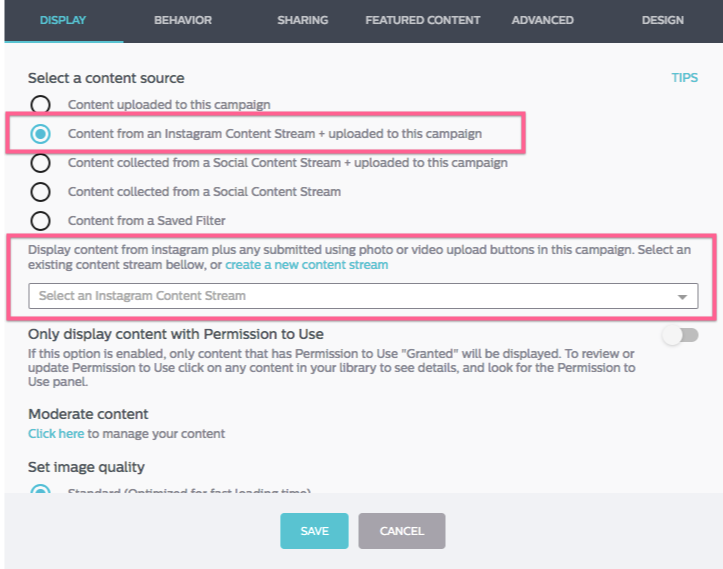 Starting on Dec. 5, you can configure ICS to collect Instagram content that includes a #hashtag, even if your brand is not @mentioned. We’re phasing out support for Instagram’s old Hashtag Search. On Dec. 11, the ability to collect Instagram content based on a #hashtag will be deprecated in Social Content Stream (SCS) -- as noted above, this capability is being replaced by ICS on Dec. 5. In addition, content posted to Instagram after Dec. 11 will no longer appear in experiences built with Photo Contest with Voting, and two other uses cases that were deprecated earlier this year -- Photo Video Contest and Video Contest with Voting. Content collected from Instagram before Dec. 11 will continue to be available in Wyng. Twitter content collection is unaffected. With the updates we’re making to ICS this week, you will have more flexible ways to collect and use content from Instagram. To help you get the most out of the platform and deliver the best user experience, we wanted to share the following tips and guidelines. We recommend setting up a single ICS for your brand, and configuring it to collect all Instagram posts that @mention your brand, and all posts that include any of your brand’s #hashtags. You can add as many of your brand’s #hashtags to the ICS as you’d like, however, be sure to avoid general or trending hashtags with excessive noise or volume. For #hashtag based campaigns, we recommend encouraging your audience to @mention your brand when using your #hashtag. While the @mention isn’t required in order for ICS to collect #hashtagged content, it is a best practice for reasons discussed here. All content collected using ICS flows into your content dashboard, where you can easily moderate it by approving the content you would like to use, and rejecting any other content. 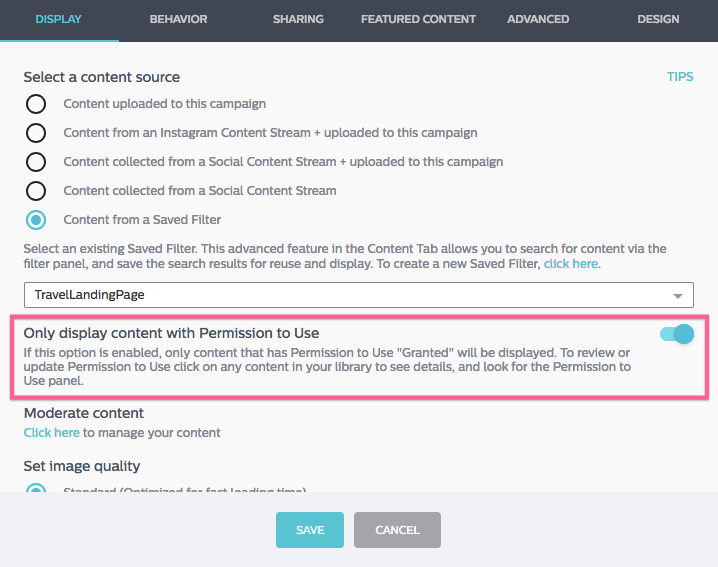 Following moderation, use tags to curate content for display. For example, to specify which content to display in a carousel on your home page, you could tag the relevant content with “homepage”. Similarly, to specify which content to display in a gallery on a travel-related landing page, you could tag the relevant content with “travel”. 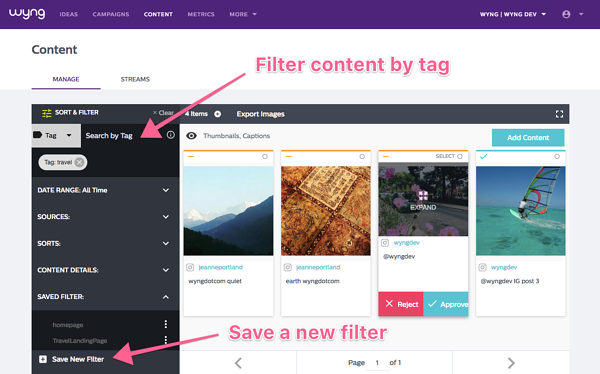 To display content you’ve tagged, you must first create a filter based on the tag, give the filter a name (e.g. "TravelLandingPage") and save it. 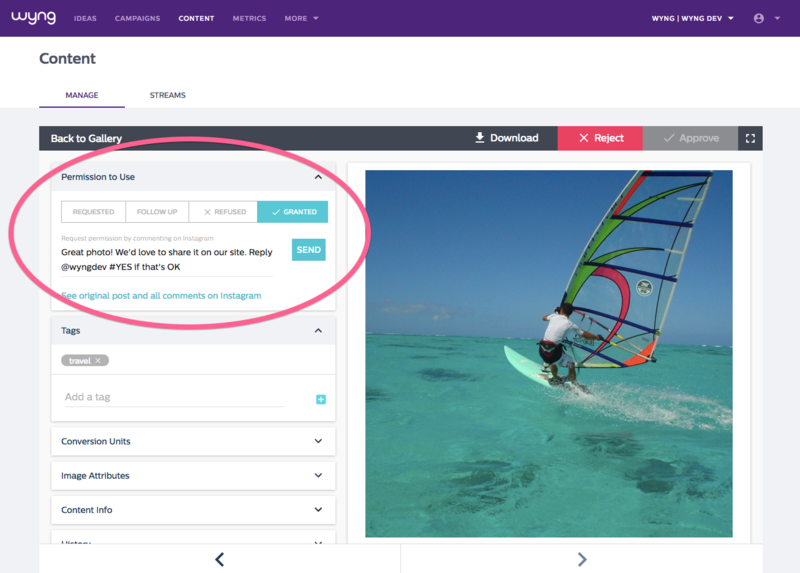 If your brand was @mentioned on the original post, you can request rights by commenting directly from the Wyng dashboard -- for example, “Great photo! We'd love to share it on our site. Reply @YourBrand #YES if that's OK.” If your brand was not @mentioned, you can request rights by commenting natively on Instagram -- Wyng makes this easy by providing you a direct link to the post, and language that you can copy/paste to comment. While most brands set up a single ICS with their @mention and #hashtags (as described above), it is possible to set up a separate ICS for an individual #hashtag campaign. If you choose to set up separate ICS, a benefit is that all content collected by the ICS is automatically grouped and available as a separate “source” in the content dashboard -- so you don’t need to use tags to curate content for display. You can simply update the "source" settings in any gallery or carousel component to refer to the source ICS -- see the screenshot below. Keep in mind, however, if content matches criteria in more than one ICS, you will get multiple copies of that content in your dashboard. We’re excited to have completed the migration to Instagram Graph API. Going forward, we will continue to innovate with Instagram, and add new capabilities for user generated content from customers, advocates and influencers. Wendell Lansford is the Co-Founder of Wyng.